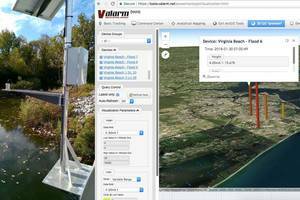 Senix ToughSonic sensors have been integrated and installed by Valarm Inc. in the StormSense flood monitoring and forecast system in the Hampton Roads area of Virginia. “We’re pleased the City of Virginia Beach is using ToughSonic sensors for their implementation of the StormSense system.” said Sam Crawford, general manager of Senix Corporation, located in the scenic New England town of Hinesburg, Vermont. ToughSonic sensors, waterproof and housed in stainless steel, have become the “flood sensor” of choice for flood monitoring systems all over the world including the Iowa Flood information system, the Philippine Metro Advanced Traveler Information System, and the Murray Australia irrigation system. Every ToughSonic sensor has a built-in microcontroller and digital filters that distill numerous ultrasonic “pings” taken over several seconds down to just one single measurement output to the monitoring system. The final measurement the user sees excludes extraneous objects, such as birds, bugs, or other objects passing through the ultrasonic beam. This filtering capability can determine the average of wave heights instead a wave peak measurement from one ping and then a wave trough the next. To learn more about Senix ToughSonic, Valarm and StormSense, click here. Since 1990, Senix has delivered more than 92,000 non-contact ultrasonic sensors. Senix ToughSonic sensors, known for their durability and flexibility, are in use today in applications as varied as measuring the height of children; controlling mirror focus in flight simulators; maintaining the fly-height of the America’s Cup hydrofoil boats; ensuring smooth manufacturing of metals and plastics; measuring liquid levels in water, diesel and chemical tanks; monitoring irrigation system water levels; detecting trees in orchards to conserve agricultural spray chemicals; and, of course, to monitor water levels in flood warning systems.